In Dartmouth, the sense of history is almost palpable – and nowhere more so than at the town’s castle, which has stood guard over the River Dart for centuries. Few other British fortresses are as historically significant or stunningly situated as Dartmouth Castle. The Guardian of the Dart (as it’s often called) has protected the townspeople since the Middle Ages. Dartmouth Castle’s defensive role is now symbolic, but between the late 14th and mid-20th centuries this military stronghold saw ‘active service’. The range of architectural styles it encompasses, from the remains of the medieval fortalice to the 1940s gun house disguised as a tower, reflects the development of weaponry and warfare over hundreds of years. The castle is further distinguished by the presence of one of Dartmouth’s oldest places of worship, St Petrox Church, which dates back to at least 1192. The Grade I listed church represents ‘serenity and strength’ (in the parish authorities’ words). It must’ve been a welcome refuge for men defending the town in days gone by; a place where they could, even just briefly, turn their attention away from fighting and contemplate peace. Peace was in short supply when work began on Dartmouth Castle in 1388, as England was in the midst of the Hundred Years’ War against France. Meanwhile, English privateers (sailors licensed by the government to plunder vessels from France and elsewhere) were instilling anger in many foreign powers. As a prosperous town with an important harbour, thriving import/export trade and access to the English Channel, Dartmouth was an obvious target for invasion. It therefore required robust coastal defences – a fact that certainly didn’t escape the monarchy’s attention. A 1388 entry in the Close Rolls, the royal chancery’s administrative records, emphasises that a building suitable ‘for defence of the town and ports adjacent’ was urgently needed. Dartmouth’s foremost privateer and mayor, John Hawley, was authorised to erect the castle’s first defensive structure. By building a high-walled fortalice, Hawley played a key role not only in protecting Dartmothians but also strengthening national security. Eventually, Dartmouth Castle would be supported by a companion on the opposite side of the Dart, the 16th-century Kingswear Castle. Towers with an enclosing wall enabled men armed with catapults to attack French warships and other enemy vessels. Dartmouth Castle’s defences were enhanced by this early British example of a fortification for cannon capable of sinking ships. The gun tower also housed the mechanism for an enormous chain that stretched across the river and could be raised to stop vessels in their tracks. After Henry VIII rejected the Pope’s authority, fears of an invasion by Catholic countries led to three gun batteries being built. Royalists gained control of Parliamentarian Dartmouth’s castle after exploiting its vulnerability to attack by troops on the ground. It wasn’t recaptured by Parliamentarians until three years later. With tensions mounting between the English and French, the main Tudor gun battery was upgraded to form the dual-level Grand Battery. Dartmouth Castle was equipped with shell-firing cannons to defend against warships. The castle was armed with quick-firing guns able to attack enemy ships carrying torpedoes. Soldiers benefitted from guns that were shielded from air raids by purpose-built gun houses. 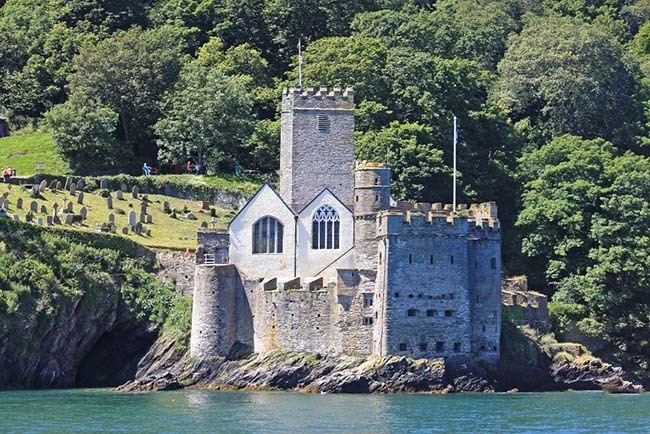 Dartmouth Castle is now an internationally important attraction visited by tens of thousands of people each year. Many approach it by boat – and receive a rather more friendly welcome than might’ve been the case in the distant past! Our aim at BuyAPieceOfDartmouth.uk is to enable you to create a lasting link with the glorious area of Devon long watched over by Dartmouth Castle. We invite you to claim ownership of a compact land parcel (20 cm x 20 cm) close to the Dart and, if you wish, adopt a presumed, aristocratic-style title to boost your status. Imagine amazing your peers with the news that you’ve become a Lord or Lady of Dartmouth! All you need to do is purchase our Dartmouth Land Parcel (£795) or Dartmouth Land Parcel and Seated Title (£995) package (click on either for full details). Rest assured that the price includes all the required legal fees. Become a titled landowner in prestigious Dartmouth today – it couldn’t be easier!